We’ve been receiving a number of questions from the Pizza Bible community about poolish and other pre-ferments. Let’s take a closer look at poolish, and the role it plays in pizza making. First, some background. In baking and pizza making, you can make dough using one of two approaches: The first approach is a dough which uses a pre-ferment, also known as a starter. Throughout this article, I’ll use the terms “starter” and “pre-ferment” interchangeably. This involves mixing a small amount of flour, water and yeast ahead of time. After it has developed, the pre-ferment is incorporated into the dough, resulting in a pizza or bread with a more complex flavor. Poolish, levain and biga are different types of starters. While similar in concept, each varies in terms of yeast, hydration and development time. The second approach, known as a straight dough, skips the starter and is prepared in a single stage. It relies on a longer rise time and uses less yeast. While you can achieve excellent results with both approaches, today we will focus only poolish. Put simply, the most compelling reason for incorporating a poolish into your pizza dough formulation is to achieve an end-result that is noticeably better in terms of texture and flavor. While it’s an extra step, a poolish can be prepared in under 60 seconds. The results are well worth it. Based on the recipe above, we use 10% of the flour amount, or 50 grams. Our poolish will be mixed in a 1:1 ratio, meaning we’ll also use 50 grams of water. This recipe can be easily scaled. In a 16 ounce mason jar, or similar container, add the water and yeast and whisk vigorously until dissolved. Add the flour and mix with a fork until fully incorporated. Using a small silicone spatula, scrape the dough mixture from the side of the container. Cover tightly and place in a warm spot for 8-12 hours. The amount of poolish to incorporate into a recipe is subjective. Like most things in pizza making, and in life, there’s no one right answer. But, it’s helpful to get some perspective. In the formulation above, we prepared a poolish that contains 10% of the total flour called for in the recipe. Typically, pizza recipes use a value that’s in the 10-20% range. In bread baking recipes, this number can go as high as 30-50%. Adjust the values to suit your needs. Like poolish quantity, the amount of time needed for a poolish to properly develop is also subjective. In “average” conditions, a room with a temperature of 70F, a 12 hour timeframe is a good starting point. I’ve seen this number go as high as 18 hours and as low as 4 hours. You can tell a starter is ready from its appearance. 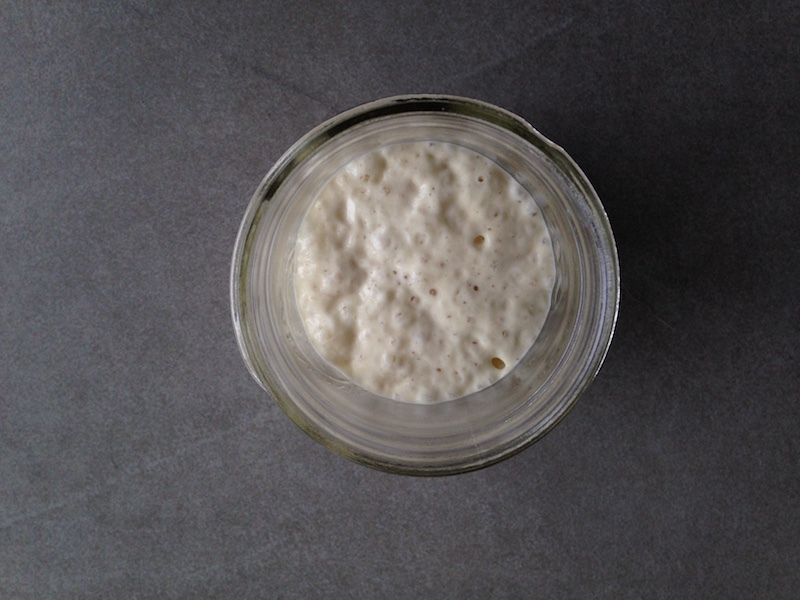 A properly developed poolish at its peak will form a dome and have a bubbly appearance. It will smell yeasty but not overpowering. Past it’s peak, the poolish will start to collapse, and develop a stronger smell. Now that your poolish is ready to go, it’s time to incorporate the mixture into your final dough. After the remaining flour, water and yeast for the final dough have been combined, add the poolish to the mixture. Please be sure to post any questions or comments below. If you’ve found this article helpful, please share!